One of my all-time favorite sites to go to for ordering Jeep stuff online is All Things Jeep. Jean and Norman have a great selection of unique supplies for Jeep owners, including a terrific collection gift ideas for the Jeep lover. I like their site better than a lot of the other Jeep sites out there because they have a lot of “retro” looking stuff, as well as classic (and classy) modern day gear and attire. Lots of unique Jeep stuff, that’s for sure! In my opinion, the following Jeep gifts are timeless. Whether you’re buying for Christmas, a Birthday, Mother’s Day, Father’s Day — or any day in between — you’re sure to find something unique and fun here. Jim and I actually own many of these items ourselves. A couple of these would be just perfect for the basement/game room in the new home that we’re building. Besides that, these Jeep switchplates would look great in a garage or hobby room, as well. I love the wide tread effect! I’ve always wanted to have one of these. You have a couple of choices with a sign like this… you could place it somewhere on the side of your house or parking area, or even display inside the garage. We own this one. And people always ask where we got it. With this on the spare tire of your Jeep, it gives everyone the impression that you’re a fun, laid-back person that enjoys spending a lot of time in your Jeep. That’s us alright! We looked high and low for a way to turn the lights off in our Jeep when we were riding around with the doors off… until we found this! This handy little gadget turns the dome light off any time you’re driving around with the doors off. We don’t own these yet, but plan to soon. Jim & I kind of “collect” Pilsner glasses — without even realizing it. Every time we visit bars & restaurants that have been memorable, we tend to buy one of their commemorative Pilsner glasses. We look forward to adding these Jeep glasses to our collection. For the Jeeper with a new baby… you can’t beat these adorable Jeep overalls and orange t-shirt set. This is a rough & tumble set of Jeep clothes built just a rough & tumble as a new Jeep! We own this… and love it! It’s huge (16″x12.5″) and very durable. It’s got tiny holes in the corners which make it easy to hang on the wall. And it’s a definite conversation piece because it looks like an authentic classic Jeep sign. 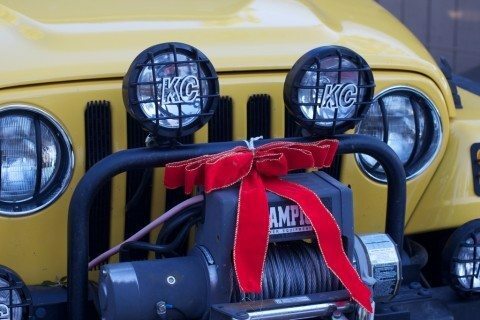 For the Jeeper in your life (…is that you? ), check out these really cool Jeep T-shirts! Some have that retro feel to them. Rough & rugged… just like a Jeep. This photo frame is made of metal — it will last forever. 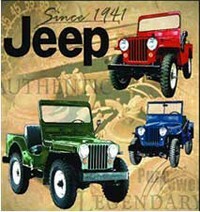 It’s that antique green & brown color that resembles the classic Jeep vehicle. It’s got a 3-D Jeep grille for added depth & dimension. I like that it holds a 4″x6″ photo right-side-up. Or, you can flip it over and display your picture upside-down or vertically instead. Fun, right?! Don’t forget Fido! A Jeeper’s second best friend (after his Jeep, of course) is usually his dog. So you know that they would appreciate anything Jeep-related for their beloved four-legged friend. These dog collars, dog leashes, and dog tags are the most basic of all gifts for the Jeep dog in your life. A blanket like this makes a great gift because many Jeepers keep one in the back. But they look great when used inside the home, as well! If you ask me, the best gift we ever bought for our Jeep is this one-of-a-kind Jeep roll-up bag. We have been using our for years, and it’s been a lifesaver! It keeps your vinyl windows from getting scratched when they’re removed from the soft top. And your windows are always within reach because they’re stored compactly within layers of felt that are perfectly sized and so they pack (or “roll”) together neatly within the storage bag that rests on your Jeep’s soft-top when it’s in the “down” position. We love, love LOVE this Jeep storage bag for soft top windows!!! A new paperback book for little kids about two Jeeps. The illustrations are awesome. This book is unique in that it’s truly a toddler book about Jeeps, and there just aren’t many of those available. Looking for holiday cards? Here’s the best Jeep holiday cards I’ve found. There are lots of different Jeep designs to choose from. Happy Holidays!